2 of 3 Heat oven to 400 degrees F. Select a 14 x 4 x 1-1/4-inch tart pan with removable bottom or 9-inch round tart pan with removable bottom. Roll out dough to 15 x 5-inch rectangle for rectangular pan, or 10-inch circle for round pan. Fit dough into pan. Prick bottom and sides of dough with a fork. 1 of 1 Bring milk and 3 tablespoons sugar in saucepan to boiling, stirring to dissolve sugar. Remove from heat. Whisk yolks, remaining 2 tablespoons sugar in small bowl until lemon-colored and smooth. Whisk in flour until smooth. Whisk in a little of hot milk mixture. Whisk yolk mixture into milk mixture in saucepan. Bring to boiling, whisking; simmer 2 minutes until thickened, whisking. Remove from heat. Stir in butter and vanilla. Strain through sieve over small bowl. Cover pastry cream surface directly with plastic wrap; refrigerate until chilled, 2 hours. 1 of 1 Cut pineapple into thin slices. 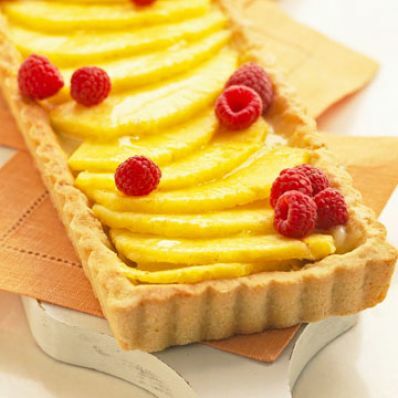 Spoon pastry cream into tart shell, spreading to edges. Top with pineapple, berries. Serve immediately. Makes 12 servings.